The commander of the Air Force, Brigadier Juniti Saito, today confirmed the sale of nine Embraer Super Tucano to Guatemala and Senegal. 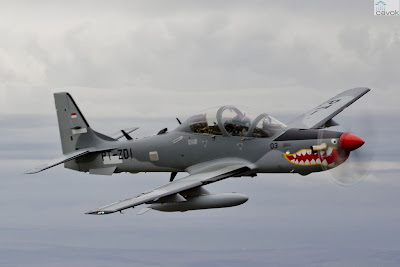 According to him, interest in the model turboprop light attack, produced by Embraer, has recently increased after the U.S. Air Force confirmed the purchase of 20 aircraft. The U.S. Air Force, according to Brigadier, has also authorized the purchase of another 35 Super Tucanos, which brings the contract value of $ 427 million to about $ 1 billion. "The commander of the Philippine Air Force came to me today during the fair international LAAD to talk about his interest in acquiring the Super Tucano," said the Commander. The brigadier said he will meet with the commander of the Philippines to talk about the experience with the FAB aircraft. The Brazilian Air Force is the largest operator of Super Tucano in the world, with a fleet of 99 aircraft.